Each year, thousands of congregations set aside a day to pray, learn, and act near Earth Day, which falls on April 22. In 2019, Earth Day falls close to Easter. Earth Day Sunday can be celebrated April 28 or another day convenient for your faith community. The 2019 theme focuses on children and youth leading the way for creation justice. Our Christian education and action resources will feature stories such as that of the youth who brought the Our Children's Trust climate change lawsuit against the federal government. The resource to be available for download now at www.earthdaysunday.org. The Bible is full of beautiful language and theology for celebrating God's Creation. Yet sometimes, in the rhythm of the liturgical year, it can be challenging to find a specific time to focus as a church community on the theme of Creation. Earth Day Sunday provides just such an opportunity. Since 1970, communities have taken one day each year to be especially mindful of the Earth and its many gifts: April 22, Earth Day. This day has ecumenical and bipartisan roots. Each year, Creation Justice Ministries focuses on a particular ecological theme chosen by our members. We highlight a number of ways individuals and congregations can celebrate and protect God's creation. We hope these ideas inspire further thoughts, conversations, and actions in answering God's call to be faithful stewards of Creation. 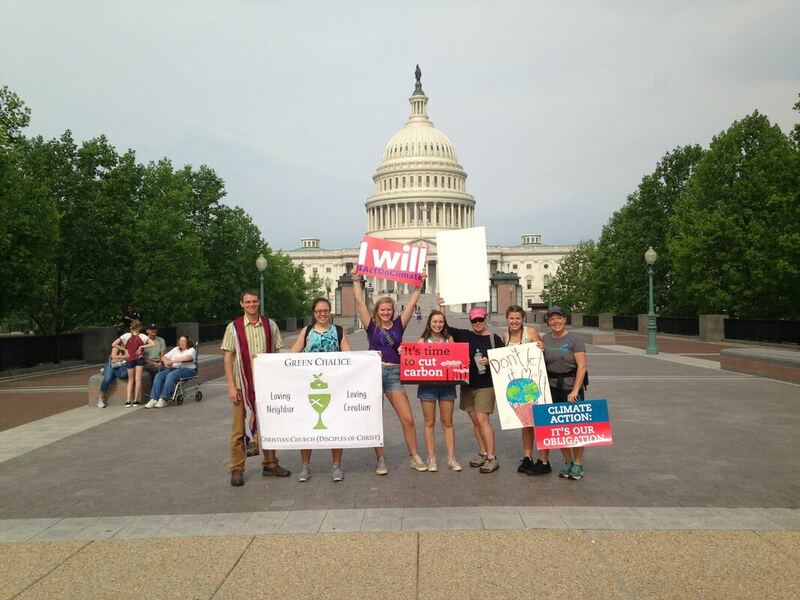 Do you want to plan an Earth Day celebration in your congregation? Consider using our theme materials for this year, or find a treasure trove of Earth Day Sunday resources from previous years on various creation justice themes on our education resource page. We've also listed some ideas below which have stood the test of time for many congregations. Plan an Earth Day themed worship service. Find a wealth of Earth Day Sunday worship resources at www.creationjustice.org/educational-resources. Have bulletin inserts or handouts for congregation members. Most of Creation Justice Ministries' Earth Day Sunday worship resources have bulletin insert handouts included, but you can also opt for something your congregation is currently working on. For instance, "Ten Steps to Green Your Home" or "Products to Green Your Home" - include energy efficient light bulbs, environmentally friendly cleaning supplies, low-flow faucets and shower heads, information on energy efficient appliances, 100% post consumer waste recycled printer paper, and more. Host a special "Creation Justice Fellowship Time." Serve organic, fair-trade coffee and treats from a local organic bakery; use re-useable plates, cups, silverware, and napkins, or if that isn't possible, recycled or biodegradable disposables; and post big, easy-to-read signs to educate people about what makes your fellowship oriented toward "Creation Justice." Have a Creation Justice Church workday to set up rain barrels, install faucet aerators, do native landscaping on church grounds, replace incandescent light bulbs with energy efficient bulbs. Examine your church's energy use by performing an energy audit and present your findings on Earth Day Sunday. Hold a "town hall" discussion about how your church can reduce energy use. Plan to officially join your denomination, fellowship, or communion's ecological ministry and announce/celebrate it on Earth Day Sunday. Plan a community service project like a Clean-Up in a local park, along a local body of water, or near a highway. Organize a hike at a local trail, park, or natural area. Make sure you organize carpools for transportation to and from the site. If you're not sure where to go, check www.findyourpark.com for ideas. Plan an Earth Day festival. Ask local environmental groups to set up informational booths. Invite local growers/food producers and artisans to set up booths to showcase and/or sell their products. Arrange for a variety of brief informational or practical workshops where people can to go learn about Eco-Justice issues (especially your Earth Day theme) or learn how to do something (like make an effective call to an elected official, adopt sustainable office practices, or start a compost pile at home).